Ready to learn something about French desserts? Sometimes it is fun just to spend a little time gazing upon the possibilities before taking the plunge, tying on your chef's apron and trying them out for yourself. Or if you are planning a trip to France this should give you a good idea of what to look for on restaurant menus, in pastry shops, or in a salon de thé. If you are anxious to just get started making these yourself, then be sure to check out our collection of (all pretty easy) French dessert recipes. Otherwise, let us get on with a little lèche-vitrines (that is literally window licking, but translates to window shopping) . . . These molded cold desserts might include whipped cream, crème anglaise, fruit puree, meringue, chocolate or liqueur. They are set with gelatin and are known as Bavarian creams in English. Although frequently made with the same basic preparations, the variety of gâteaux in France is nearly infinite. 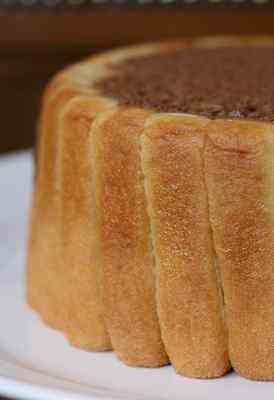 Note that the French word cake refers to unfrosted bread like cakes that might include fruit or nuts. Lady fingers, brioche, or even macarons are dipped in a liqueur and then used to line a special cylindrical mold which is then filled with a cold Bavarian cream, mousse, or fruits. A simple and airy pastry made from water, flour, butter and eggs. It is first cooked on the stove top then baked. 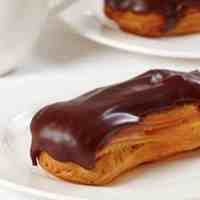 It is used to make profiteroles, eclairs and any number of elaborate French desserts. Macarons, sablés, speculoos, langues de chat, madeleines, and palmiers are just a few of the cookies popular in France. Learn more here: French cookies. A number of different creams serve as the basis for making other French desserts. These include crème anglaise (a sort of custard sauce), frangipane (an almond flavored cream), crème pâtissière (pastry cream), and crème au beurre (a butter cream frosting). These are often served as part of a traditional celebration, in particular for Chandeleur, the French version of Candlemas. Crêpes Suzette is perhaps the most famous, but there are many other crepe preparations. Any dessert that is not a cake or pastry might be referred to as an entremets in France. The term is particularly associated with cold desserts such as flans, charlottes, or puddings. As well as serving as an ingredient in other French desserts, fruit may take the center stage. They might be flambéd, poached, baked, or made into compotes (stewed fruits). Chocolate and whipping cream are mixed together to make a chocolate ganache, used to frost or fill cakes. A ganache might be made with different sorts of chocolate and flavors. Frequently made with beaten egg whites, but also whipped cream, and even thickened with gelatin, these are light airy preparations that might be enjoyed on their own or used to fill another dessert. In France, a pudding normally includes bread or cookie crumbs, but also rice and semolina wheat. Maman might have this one simmering on the back burner as she is cooking dinner: Easy Rice Pudding Recipe. Any small bite sized dessert could be referred to as a petit four. They are elaborated to please the eye as well as the palate. Frequently they are made from genoise cake and frosted with fondant icing. This is France, so of course sauces play a part in dessert as well. Crème anglaise (a custard sauce) is served alongside all sorts of desserts. In addition, fruit coulis, made by cooking fruit in sugar syrup and than pureeing the mixture, are also popular. Includes fruit and nut tarts of all sorts: apple, plum, strawberry, apricot, blueberry, lemon and pear are some common variations. The base might be puff pastry or short bread, and there is likely to be a layer of pastry cream under the fruit. Yeasted pastries that include croissants, pains au chocolat, chaussons, brioches and many more. Although often sweet, these are typically eaten for breakfast in France. It all looks so tempting and good, does it not? But there is more to life than dessert! Learn more about some of the best food in the world. Go from French desserts to French Foods.